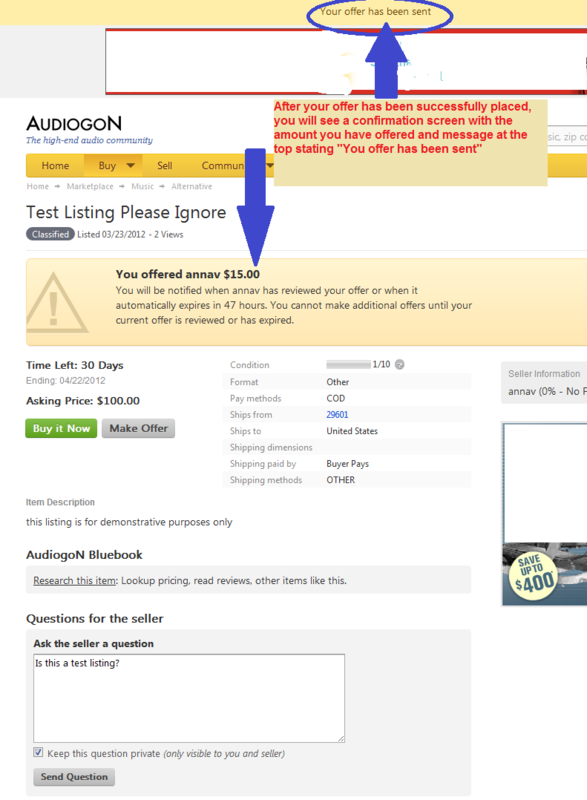 Making offers on Audiogon’s Classified Listings has changed a bit since we launched the new site. Here is a handy reference guide from both the Seller and Buyer perspectives. For Buyers, you will see how to make an offer so it’s properly recorded and what to do if the Seller counters your offer. Sellers will see step-by-step how you’re notified of an offer and how to make a Counter-Offer. 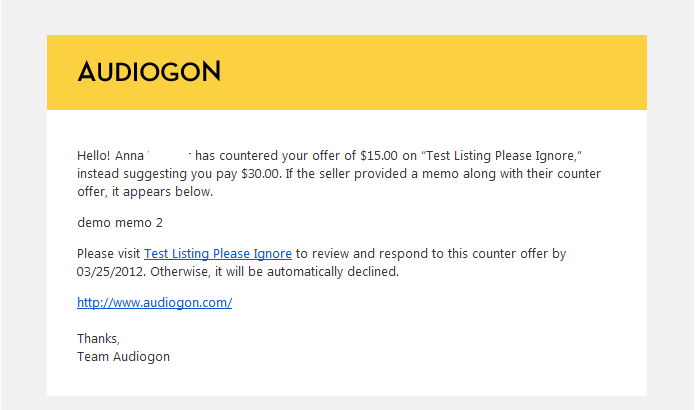 *A note on Pending Sales: We are developing a clickable option for Seller’s to mark their listing as “Sale Pending.” Until that time, we strongly suggest that Seller’s edit their listing’s text to denote negotiations have begun with a potential Buyer or removing the “Buy It Now” button by clicking on the link to your listing and going into Edit mode. When you view a listing that has the Buy It Now option, please review the description to determine if there is a pending sale. 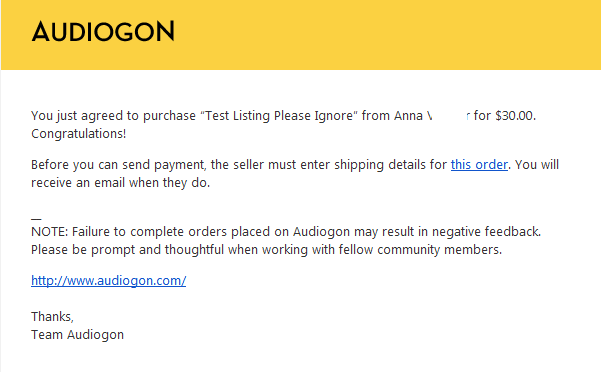 The Seller will receive a notification email from Audiogon regarding your offer. 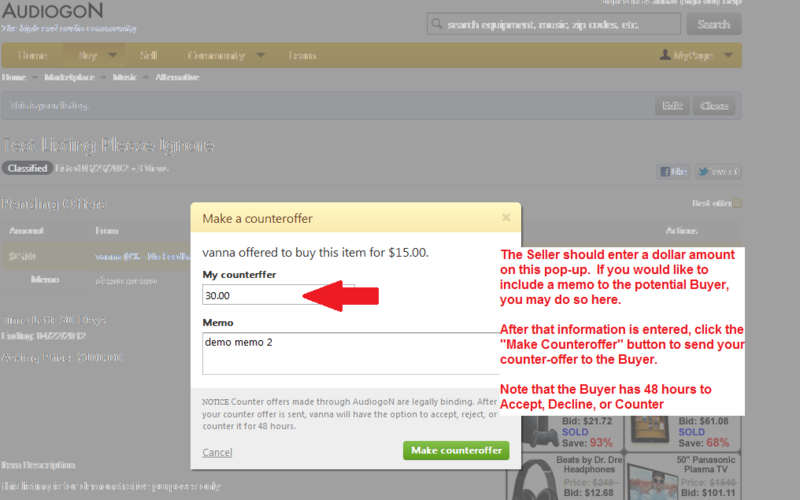 The Seller must log on to his account in order to Accept or Counter your offer. Your offer may be declined automatically at the end of the 48 hour period, or the Seller may log-in to actively decline your offer. 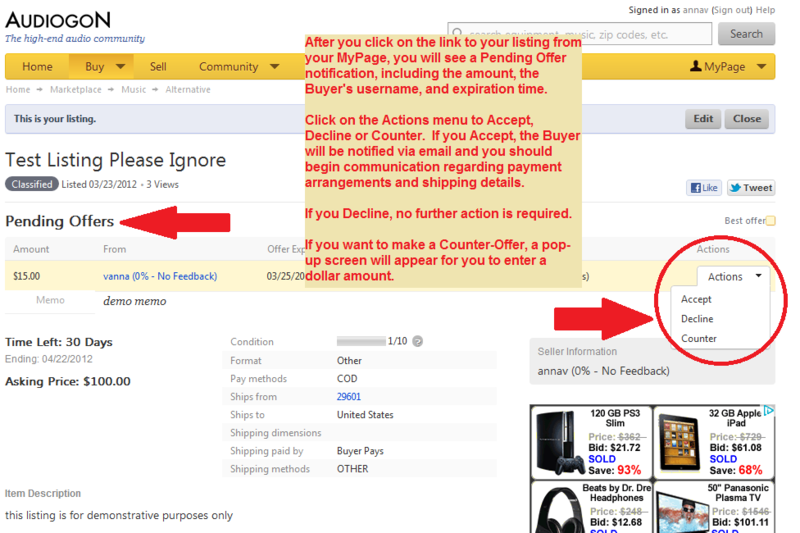 Please log in to your MyPage in order to Accept or Counter the Seller’s Counter-Offer. The Seller’s original Counter-Offer is live for 48 hours, at which time it will automatically decline, but it is courteous to log in and actively Decline a Counter-Offer so the Seller is able to confidently move forward with other prospective buyers. 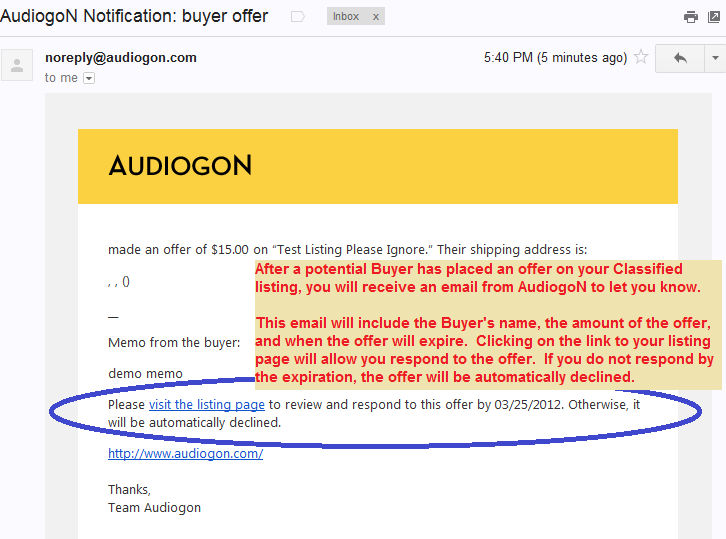 After you have accepted the Seller’s Counter-Offer, you will receive a notification email from Audiogon. 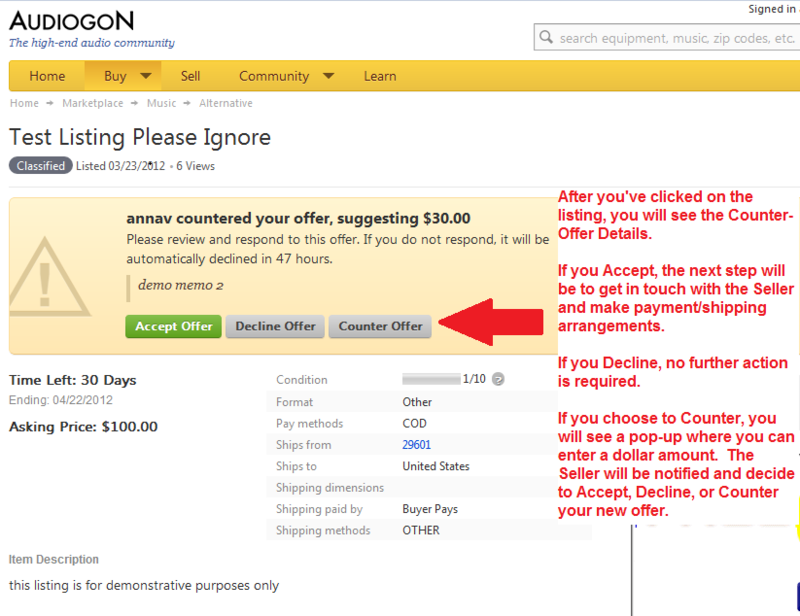 Please log on to your MyPage to Accept, Decline, or Counter-Offer. It is courteous to the prospective Buyer to Decline offers via the site, rather than letting the offer run out at the end of 48 hours. 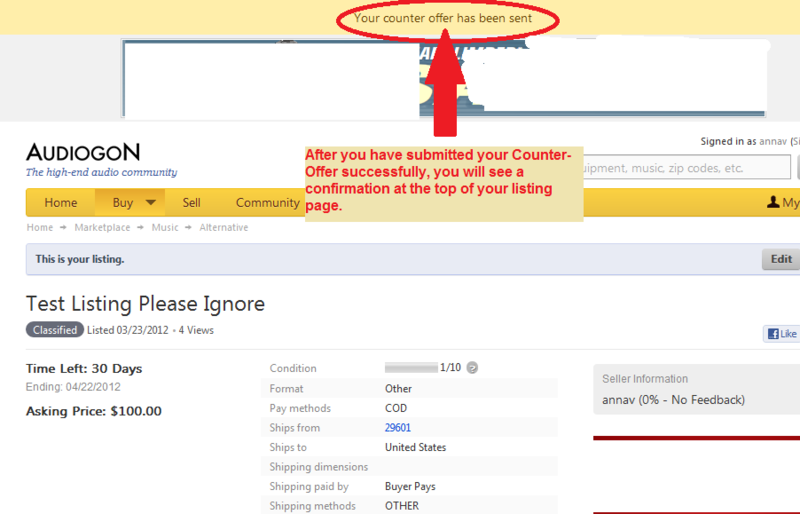 Your Counter-Offer has been successfully submitted to the Buyer ONLY when you see the message below. 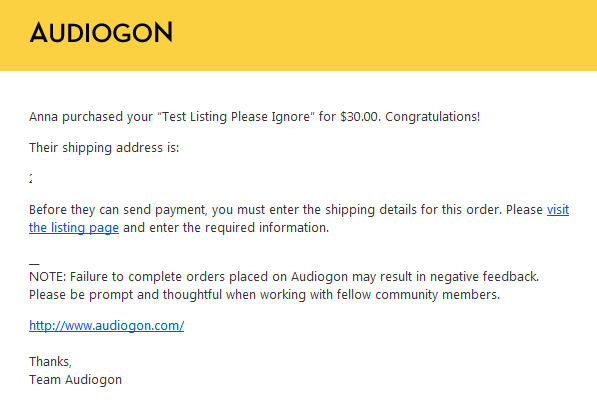 When the Buyer has accepted your counter-offer, you will receive a notification email from Audiogon. At that time, it is appropriate to enter shipping details and get in touch with the Buyer. All listings remain active but with a sold status for 30 days to allow for communication between the Seller and Buyer. 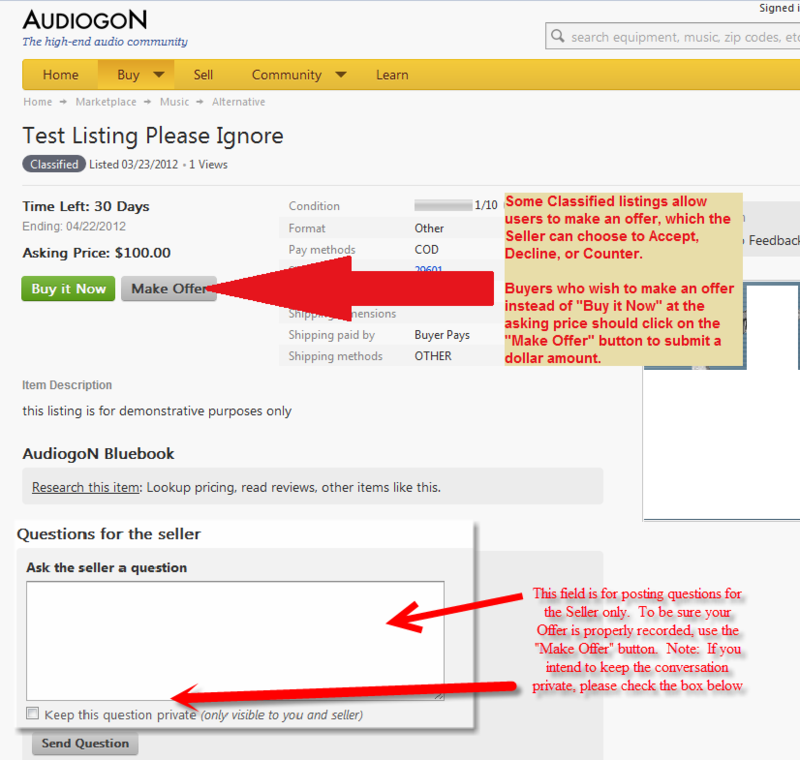 Don’t forget to close your transaction by “Marking the Item As Paid” (lower right corner of actual listing) and submitting Feedback! Thank you! We’d to love to hear your thoughts! Comments may be submitted via the form below. If you have any service-related issues, please contact us by entering support ticket here.